The 5 day holiday in early May has attracted tens of thousands of people to the beach city Halong, the number of tourists flock to the Bai Chay resort area in Halong Bay increased day after day. Roads and streets in Halong city were in constant congestion. Visitors arrived in Halong city from 30th April to celebrate Halong carnival took place here. There are an estimated 500,000 visitors to Halong for the biggest festival of the year in this city. The Halong tourist area was in full congestion, tourists flocked to Vuon Dao area where many family hotels and guest houses are located. All hotels and restaurants were crowded, private lodging and mini hotels in the housing areas such as Cai Dam, Hung Thang, Hon Gai and Bach Dang were also fully booked. 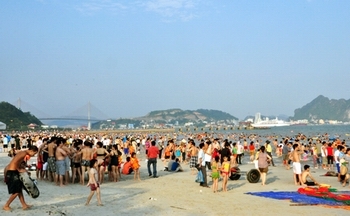 At Hoang Gia and Thanh Nien beaches, the number of people increased 4 times compared to normal days, from 8am to 6pm were full of tourists. The number of people visiting Halong Bay soared and the temporary parking areas were organized in the city but always in overload. Halong Bay is a popular destination for local and international tourists, many travel company had to cancel their tours to Halong Bay as it was impossible to book services at daily prices. According to survey carried out in the holiday prices for food and accommodation has increased from normal days. Guests staying at the private hostels in Vuon Dao, Hung Thang...rose from 400.000 vnd (approximately 20 usd) a room to 800.000 vnd or even 1 million, in the streets of Le Thanh Tong, Doan Thi Diem in Hon Gai area room rates went up 20 percent compared to normal days. Many travelers complained about price of food and services at some restaurants, entertainment parks and hotels, and quality of 1 million vnd rooms were incommensurate. Tran Trong Trung, vice president of Halong city people's committee said that before the holiday, the city's inspection teams visited and checked with all hotels and restaurants throughout the city, facility owners were required to specify prices and hotline phone number so that tourists can promptly report to the authorities. Trung acknowledged that there were some increases in service prices at a few hotels and restaurants however the rise were just slight and not 2 to 3 times higher than normal days.